King Khafre was the fourth ancient Egyptian pharaoh of the 4th Dynasty. He was the son of Khufu by queen Meritites I and he reached the throne after the death of his elder brother, Djedefre in 2570 B.C. He ruled Egypt for about 26 years and then he was followed by his son Menkaure. His wives were Queen Khamaerernebty I and Queen Meresankh III. He had many sons including Menkaure, Misuerre, Nikawre, and Khenterka in addition to a couple of daughters: Khameremebty II and Shepsestkau. King Khafre was the son of the great king Khufu and it is believed that his mother was Meritites I but there is no evidence about his mother. King Khafre got married about 4 times and he had nearly 12 sons and 3 daughters. Khamerernebty I was his main wife and she was also the mother of the next pharaoh, Menkaure. Queen Meresankh III was actually the daughter of his brother Kawab so his wife was actually his niece. Hetepheres II was another wife of King Khafre, who got four sons of King Khafre. Present was his last queen of King Khafre and the mother of Nikaure. It is believed that King Khafre ruled between 2558 BC and 2532 BC, which gives him about 24 to 25 years of rulership. We don’t have much information about his achievements in the development of his state or its welfare but we know that he ruled most of the areas in modern Egypt. King Khafre pyramid in Giza says a lot about the state of wealth of the Egyptians during his reign. King Khafre should get the credit to for his splendid construction of the Sphinx, which is located in Giza Complex and its face was believed that it resembles King Khafre but was later discovered that it actually resembles the Sun God, Harmachis. He used to build statues for himself more than any other Egyptian ruler did. King Khafre pyramid is smaller than his father’s with only three meters but it lies on a higher ground, which makes it looks taller than Khufu’s Pyramid. King Khafre was known as Chevron, which was his name in Greek. He ruled the fourth Dynasty as the fourth king of Egypt during the Old Kingdom. King Khafre was involved in the death of Djedefre but there is no accurate evidence for this but there was a history of jealousy between the members of the royal family. His father “Khufu” was the one who has built the great Giza Pyramid and his half-brother has built his pyramid at another location in the north in Abu Rawash. King Khafre was the one who initiated the Second Pyramid in Giza and the magnificent Sphinx. The location of the pyramid was chosen very carefully so that the pyramid looks taller than it actually is. King Khafre was the one who established the royal court at Memphis. It was the place where he governed ancient Egypt. His name was closely associated with the sun god Ra as his name means “Appearing like Ra”. He had some viziers like Ankhhaf, Nefermaat, Minkhaf, and Khufukhaef who were sons of Khufu. Those viziers were the main architects of the buildings of King Khafre and Ankhhaf was the first vizier to construct the second pyramid of Giza. The main target of the government during the reign of King Khafre was the construction of projects, which included the planning, designing, and constructing of the monuments. 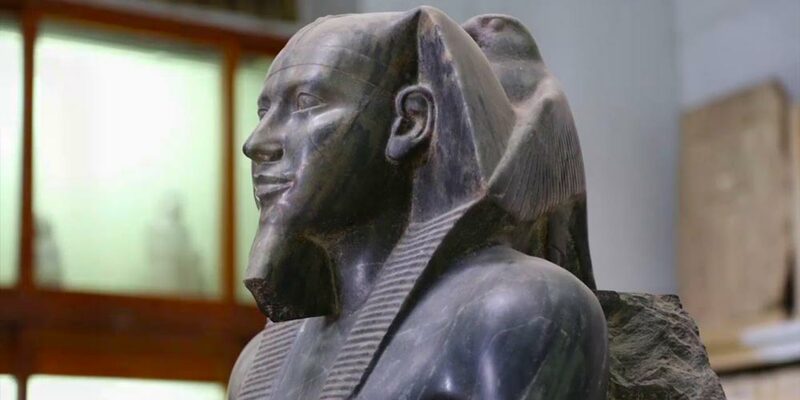 His statue in the Egyptian Museum was made of a unique material that no other ancient statue has been made of, which makes it one of the most invaluable and important statues there. King Khafre’s pyramid is a fanciful building as it keeps very interesting structural elements. The main characteristic about the pyramid is that it has limestone rock covering its apex. The pyramid is about 136.4 meters high and contains hidden chambers in the upper part yet to be discovered. There is scientific evidence for the complex organization developed during the so-called Zep Tepi, the mythological Age of the Gods. It is believed that the architects of King Khafre chose the location of the pyramid so that the king will be able to see the points of the horizon where he can clearly see the sunrise. The main name of this pyramid was “Wer (en)-Khafre”, which means Khafre is Great. It was mainly constructed as a tomb for the Fourth Dynasty Pharaoh King, Khafre and it has a base length of 215.28 meters. It is made of limestone blocks and each block of them weighs about 2 tons. It is higher than Khufu’s pyramid with about 10 m high. To get into the interior part of the pyramid, there are two entrances that lead you to the burial chamber. so “Trips in Egypt” arrange amazing trips to King Khafre Pyramid and the surrounding monuments of Giza pyramids complex through Cairo day trips to facilitate the opportunity for any traveler to visit these great ancient monuments of ancient Pharaohs. It was the place where the process of purification and the Mummification process of the mummy of the king was being operated. This temple was part of the funerary complex and it was buried under the sands of the desert until the 19th century. The Sphinx in Khafre’s complex has a very interesting history as it is a mythical creature with a face of a human “Probably Khafre’s”, a body of a lion, and wings of a bird. This mythical creature was used in the Greek methodology as a creature that was responsible for punishing those who commit crimes against the law of the state of Thebes. There is a wrong belief that the Sphinx lost its nose during the French war of Napoleon but it is not accurate as a Sufi Muslim called Muhammad Sa’im al-Dahr from the Khanqah of Sa’id al-Su’ada was the one who was responsible for the missing nose of the Sphinx in 1378 A.D.
There’s nothing more liberating and exhilarating than living part of your life on Egypt and will be increasingly more when booking a venture trip in the land of Pharaohs through our Egypt tour package to discover the highlights of ancient Egypt in Cairo, Luxor, Aswan & Alexandria beside to the possibility to taste the fun & entertainment on the fabulous beaches on the Red Sea.